 Joy Pure Grain Free Premium Dog Food is crafted using only the finest ingredients.  We start with nutrient-rich foods to ensure your dog has the health and well-being they deserve. We use wholesome fresh ingredients with no grains in our recipe. Natural sources of Omega 3 & 6 play a crucial role in a strong and healthy immune system. These Fatty Acids help maintain a beautiful shiny coat. We have also formulated this wholesome blend of ingredients to provide sources of Glucosamine & Chondroitin that support healthy joints.  Give your dog the best. Give them pure. 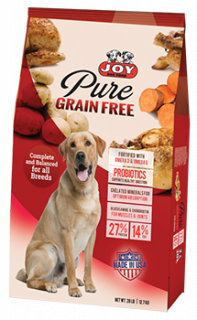 Joy Pure Grain Free is formulated to meet the nutritional levels established by the AAFCO dog food nutrient profiles for all life stages.  Chicken Meal, Dried Peas, Dried Potatoes, Chicken Fat (Preserved with Mixed Tocopherols), Dried Sweet Potatoes, Alfalfa Meal, Brewers Dried Yeast, Natural Flavor, Dried Egg Product, Potassium Chloride, Salt, Inulin, Vitamins (Vitamin E Supplement, L-Ascorbyl-2-Polyphosphate, d-Calcium Pantothnenate, Vitamin A Supplement, Niacin Supplement, Riboflavin Supplement, Thiamine Mononitrate, Pyridoxine Hydrochloride, Vitamin D3 Supplement, Menadione Sodium Bisulfite Complex, Folic Acid, Biotin, Vitamin B12 Supplement), Choline Chloride, Minerals (Calcium Carbonate, Zinc Oxide, Zinc Proteinate, Ferrous Sulfate, Manganous Oxide, Copper Sulfate, Maganese Proteinate, Calcium Iodate, Copper Proteinate, Sodium Selenite, Cobolt Carbonate), Dicalcium Phosphate, Yucca Schidigera Extract, L-Carnitine, Saccharomyces cerevisae yeast cluture, Dried Enterococcus faecium Fermentation Produce, Dried Lactobacillus acidophilus Fermentation Product, Dried Aspergillus niger Fermentation Extract, Dried Trichoderma longibrachiatum Fermentation Extract, Dried Bacillus subtills Fermentation Extract, Vegetable Oil, Lecithin, Rosemary Extract.